When someone sends me a really great YouTube video, I always want to know who’s behind it. Was it an ad agency? A small or medium business? A B2B tech company? No matter who it was, if I’m impressed, I want to see more from the content creator. So once the video is done, I click the link to visit their profiles. And from there, if the brand is really on top of its game, I’ll see its channel art — the horizontal banner displayed across the top of the user’s YouTube channel that, hopefully, shows a combination of good design and brand presence. We’ve all seen design work that inspires us, but can have a bad habit of not taking it any further than that. What makes something like a strong YouTube banner so great? And how can you create your own gorgeous channel art? To answer those questions, we found seven of our favorites that inspire us, and explain why we love them. A YouTube channel banner will take on different dimensions, depending on what platform is being used to view it. 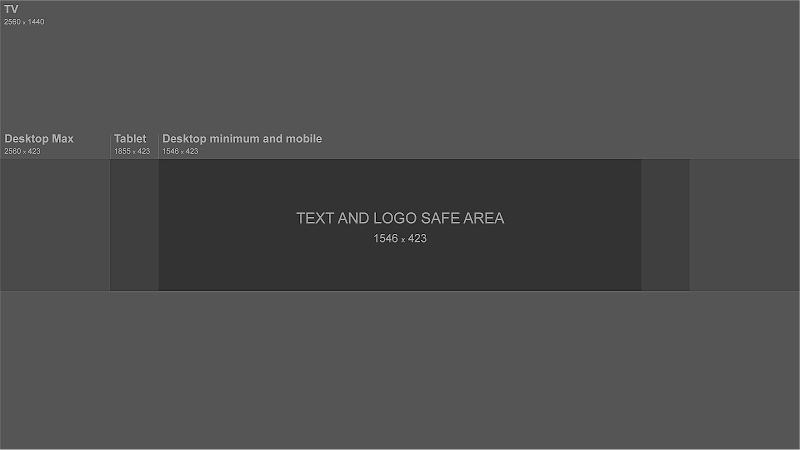 For example, a banner might have different dimensions when viewed on a TV, desktop, or mobile device. Let’s start with a note about where dimensions and design intersect. You might think that 2560 x 1440 px — Google’s suggested dimensions we mentioned earlier — seems like an exorbitantly large file size. But think about how your image would appear on a 30″ smart TV or higher. With a growing number of options to view YouTube videos in this way, you’ll want to make sure your channel art is large enough to display with quality on larger screens. Also, take note of the “safe area” we alluded to in the first section. Your banner is essentially the biggest branding opportunity for when people land on your channel, so you’ll want to make sure that it’s well-represented in the channel art. That’s why it might be best to make sure your company name and logo are placed in that space — to make sure they don’t get cut off and cause the viewer confusion as to who’s behind the video content on the page. If you’re not sure how to take up the entirety of a 2560 x 1440 frame, video production company MiniMatters suggests “build[ing] the image from the middle out,” putting the most important assets in the center, and going from there. Use a high-resolution image. A pixelated or blurry banner doesn’t exactly signal that there’s high-quality video to follow. Keep it on-brand. While your channel art doesn’t have to be a carbon copy of your logo or tagline, it should incorporate visual elements that you want associated with your brand, like certain colors, fonts, or keywords. Canva: One of our go-to destinations for DIY design, Canva offers several free YouTube channel art templates that allow you to use your own art, or its library of stock photography. Fotor: Similar to Canva, Fotor also offers a selection of free templates that allow you to use both your own visual assets or its own library of images. In 2016, Death Wish Coffee was named the winner of a small business marketing competition held by software company Intuit. The reward? A free 30-second commercial during Super Bowl 50. Since then, the self-proclaimed maker of “the world’s strongest coffee” has capitalized on that momentum by making sure its branding stays just as robust. Its YouTube banner is no exception. It’s straightforward, but also, bold. The company’s logo is displayed as the channel icon, as well as a tiled watermark that doesn’t interfere with the text display. And that message doesn’t leave any doubt about what the brand does. “World’s strongest coffee?” Okay, I’m watching. Seeing as turquoise is my all-time favorite color, there might be a touch of aesthetic bias in our selection of Adobe Creative Cloud’s YouTube banner. But color can have quite an impact in marketing — shades of blue, for example, have been found to invoke feelings of trust. This banner doesn’t just make great use of color, though. In a single photo, it connotes creativity and visual quality — two things that the Adobe Creative Cloud promises with its suite products. The person depicted seems to be creating something remarkable — an ocean inside of a balloon — with accompanying text to confirm it: “Make wow.” Plus, to learn more, social buttons are right there within the image. Is anyone else hungry? It only seems right that the channel art for a food magazine like Bon Appétit should be, well, appetizing. And with a phrase that’s used as frequently as “bon appétit” — before a meal or as the title of a pop song — it’s important that folks who land on this YouTube channel know what they’re getting into. That’s one thing that makes this banner so great. The branding is clear, from the logo icon to the iconic title text in the center of the image. Plus, the photo itself sends a signal of the type of content visitors can expect to consume — no pun intended — when they start watching the channel’s videos: All things food. One great thing about YouTube banners is that they can be swapped out or modified whenever you want, time permitting. That makes them especially conducive to temporary promotions or campaigns. That’s what tech company Taulia did for “P2P Superheroes”: a campaign that shows how its software can eliminate difficult, time-consuming tasks, helping everyday professionals focus more on the work that matters and turn them into superheroes. The banner communicates two things: 1) That Taulia is in the business of P2P (“procure to pay”), and 2) the brand really celebrates procurement specialists. And by using original, cartoon-like art, Taulia is turning what could be a dry topic into something fun and engaging. We’re big fans of showcasing the people that make your brand great. That’s one thing that Refinery29 does well, by frequently featuring its writers, editors, and content producers in its videos. As it turns out, they’ve all become quite popular personalities — which is why the brand put them front-and-center in its channel art. Creating a banner of this nature is two-fold. First, you have to find a way to incorporate your company’s talent into video content in a way that’s engaging and appealing to your target audience. Here at HubSpot, we have our blog writers, for example, recount important information from blog posts in video and audio summaries. Then, once you’ve produced enough of that media consistently — and if it’s gaining the right kind of attention — you can use those personalities to promote your channels. TripAdvisor is a resource used by millions of travelers to discover and rate lodgings, restaurants, and much more information about endless destinations. But did you know it also offers B2B services for hotel and other property owners to make the most of their presence on the site? We like to think of it as a B2B hybrid of review site Yelp and vacation rental site Airbnb. On the one hand, TripAdvisor B2B helps business owners create a profile with photos, descriptions, and other information that’s going to be helpful to travelers. But, like Yelp, it also allows them to monitor and respond to the reviews their businesses receive. That’s represented in the YouTube banner by portraying what the site is all about — travel — but also depicts the act of visitors giving feedback on their experiences by way of rating symbols. The thing that stands out to us the most about this banner is its simplicity. It represents a Italian yacht design company Nuvolari Lenard, which is known for work that emulates a luxury and chic lifestyle. And while the channel art itself doesn’t portray anything specifically nautical, the use of capital letters and tiered monochrome does connote a brand that’s high-end. Those kinds of digital aesthetics create what’s often known as aspirational marketing — the kind that symbolizes something that’s unattainable by most, but still has a vast following of people “who covet the look and feel of the brand,” as Mediaboom puts it. Can I afford a yacht? Of course not. But seeing something like this makes me want one anyway, and makes me want to consume the video content pertaining to it. It’s important to note that really cool YouTube channel art is just one part of a comprehensive video content strategy. It doesn’t matter how beautiful your banner is, for example, if your channel lacks in quality video, or hasn’t added anything new in several weeks. So, along with great design must come consistency. And as you begin to create both, you can turn to these examples for inspiration. What are some of your favorite YouTube banners? Let us know in the comments.